I brise soleil or wooden sunshades are special shading screens, made ​​with fixed slats of wood, used as a decorative and ornamental element in contemporary architecture. This accommodation is a refined and elegant solution for the excessive sunshine protection of houses and buildings , making it a safe choice for sliding walls , railings , pergolas , railings , windbreaks and cladding of buildings. Albero Maestro choose to create a stylish and functional product, designed at the specific request of the architectural firm , which has wooden slats and frame in steel or aluminum . The wooden brise soleil is perfect for outdoor and indoor works , as this material has a great environmental impact , being the wood a warm , ecological and material par excellence of the bio building. 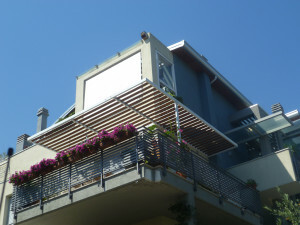 The types of wood used for the brise soleil are different depending on the application request; It will be a more ” hardwood ” used for the use of many external walls exposed and easy to contact , while in areas less at risk and with primarily decorative function , will be used a softer, more ductile wood ; of course, all types are subjected to particular treatments to be protected from atmospheric agents and so maintain in time the natural coloration . Il brise soleil in wood is a safe choice to meet the needs of shading , shielding of sunlight , protection and privacy within gardens and / or porches and buildings. Its applications are endless , as well as customization of the single module or panel. 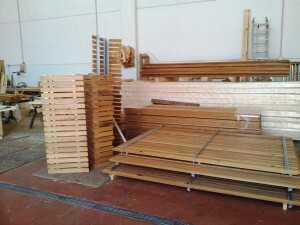 The company has played an important research to propose always new materials , and develop projects targeted to different applications , obtaining a durable product , designed to exploit an interlocking system for the locking of the slats , without the need to use screws or bolts that could deteriorate over time and cause of cracks in the wood . The study of the mounting system has allowed to facilitate and reduce the time in the laying of the product phase . The brise soleil of wood can also be provided as the mounting box and the information kit also allow the use without special skills . However, Albero Maestro has experienced installers available for transfers throughout Italy to suit the specific needs and special installation works .